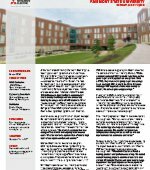 When it came to selecting efficient mechanical systems for a new apartment living complex, Fairmont State University looked at a Variable Refrigerant Flow (VRF) system from Mitsubishi Electric Cooling & Heating (Mitsubishi Electric). Buildings today are more sophisticated than ever — and the same is true for the mechanical equipment that supports building operations. This sophistication has made possible the world of advanced integration, or having a single point of control for many systems. 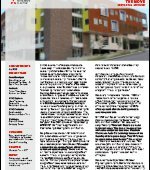 This paper discusses commercial integration and how VRF systems should be used in them. Castle Rock, Colorado built a new office building called The Move – a name that symbolized how businesses wouldn’t have to move outside of city limits to expand. The building uses a Variable Refrigerant Flow (VRF) systems with Hyper-Heating INVERTER® (H2i®) technology from Mitsubishi Electric Cooling & Heating (Mitsubishi Electric). 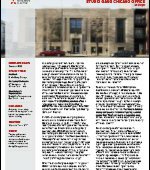 Sustainability drives both the curriculum and building design for The Willow School, so when the school was designing its fourth building – the Health, Wellness and Nutrition Center – the project team selected a Variable Refrigerant Flow (VRF) zoning system from Mitsubishi Electric Cooling & Heating.